In what seemed to be the fastest back-to-back release of new Windows 10 preview builds ever, Microsoft released yet another new build of Windows Insider preview builds through Windows Update on June 30th, 2015. Windows 10 Build 10158 was released on June 29th, 2015. That make its 2 releases in 2 days. In fact it’s faster than that, as the next build was released in less than 30 hours after the prior release. 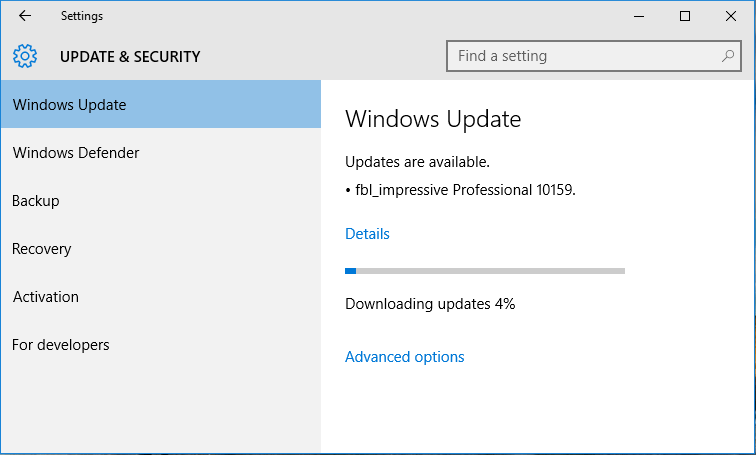 The new build is Windows 10 Build 10159, appearing in Windows Update as fbl_impressive Professional 10159. Windows 10 Build 101059 has the full build string of 10159.0.150626-1834. Although the build number has the difference of just 1 in number, according to Microsoft, Windows 10 Build 10159 includes more than 300 fixes compared with Windows 10 Build 10158. One major visual change is the inclusion of Windows 10 Hero wallpaper. In addition, the logon screen is redesigned with user’s photo take centric position. Download Windows 10 Build 10159 from Windows Update. Windows 10 Build 10159 is currently available for Fast ring. No official Windows 10 Build 10159 ISO images are released just yet too, although you can find plenty of homebrew and custom made ISOs on the search engine. So if you need to fresh and clean install, you will need to download and install with Windows 10 Build 10130 ISO and then upgrade. Note that if you’re currently using local account, you need to connect your Microsoft Account registered with Windows Insider to the device to continue receiving the new preview builds. Do caution that if you’re actively downloading Windows 10 Build 10158 when build 10159 is published, you may get an error 0x80246017. If that happens, just reboot your PC, go back to Settings -> Update & security -> Windows Update and check for updates again and the build 10159 will be offered.